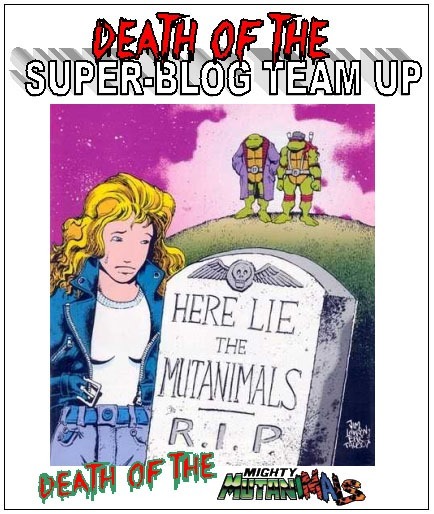 The Death of the Super-Blog Team Up Aftermath II: A Mighty Sendoff! 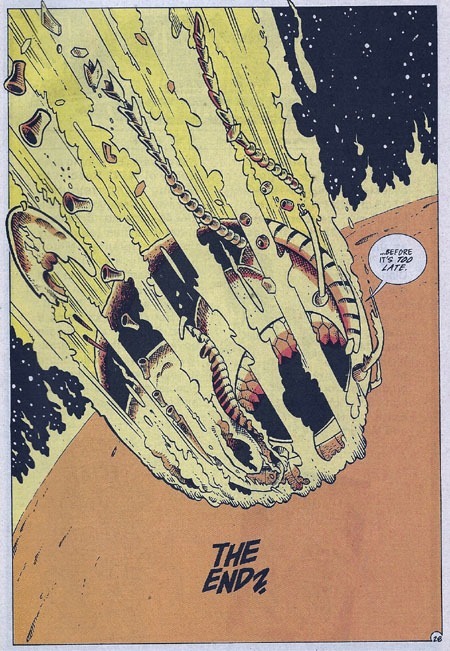 All the work I put into my Super-Blog Team Up post (The Death of the Mighty Mutanimals) and I completely forgot to include an image I’d stumbled across in a comic I stumbled across that touched on stuff. This "pin up page" was in Teenage Mutant Ninja Turtles Adventures #61. I miss this sort of thing…in addition to the full-length issue’s contents, there were also a couple of "pin up pages," showing off art that wasn’t part of the actual story. And it was original–none of this "sketch" or "process" or "dvd-style ‘extras’" stuff that gets jammed into comics nowadays to try to "justify" $3.99 or $5.99 or such. They were also largely the equivalent of what are nowadays done as variant covers. But that’s another topic for another time! And of course, if you missed it the other day or you’re reading this post out of context…check out the links below to my fellow bloggers, who were kind enough to include me in the (final?) Super-Blog Team Up! All are excellent reads, and well worth checking out! Welcome to my first-ever post of something larger than just my own posting in a near-vacuum! I was recently added to the Super-Blog Team Up, a group of bloggers who occasionally unite to thoroughly cover a topic or theme in a way that no blogger can do alone. This time around, the topic is one that has become all-too common and relatively meaningless in comics: death. There are a number of other blogs that are part of this, and I’d invite and encourage you to check them all out–both for their "tie-in" posts like mine is, but also for the indiviual flavor and content of the individual blogs. It’s quite a mix, and being in such great company has led me to try to really "up" my game with my own participating post below! 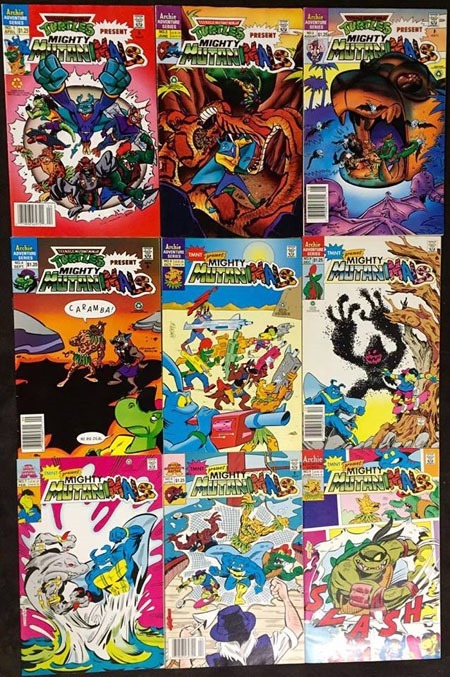 …The Mighty Mutanimals title took on a storyline that had been building in the pages of TMNT Adventures and following these other characters (and Raphael) as they fought the villainess Maligna, and ultimately stopped her invasion of Earth. The characters decided they’d worked pretty well together, and decided to stick together as a group. Thus, we then had the ongoing series of the same name. Over the course of the series, we saw them following Jagwar’s mother on the Path of the Four Winds, as she’s been interrupted by an avatar of Death. The Mutanimals catch up to, and the story reconnects with, the ongoing TMNT Adventures title for the United We Stand three-parter. This story puts the turtles and the Mutanimals against the avatars of the Apocalypse: War, Famine, Pestilence…and Death. The story sports a 3-panel image spread across the three different issues…at the end of getting the three-part story, one has the entire image and the entire story! From there, we’re introduced to the villainous shark Armaggon, setting the character up for The Future Shark Trilogy in TMNT Adventures. The team then re-encounters Captain Mossback, a figure Man Ray had faced in the past with the turtles…and then Slash returns, and seems to somewhat have his story resolved. Surprisingly (to me at the time) that Slash issue turned out to be the final issue. I didn’t much follow "solicitations" and the like, though I’d occasionally get an issue of Advance Comics to check out upcoming DC and Marvel stuff. But I found out that The Mighty Mutanimals was ending when I read the note in issue #9 stating that it was the final issue. Not long after that, I learned that the Mutanimals were getting a "backup series" in the main TMNT Adventures title, and looked forward to it. The backup spanned the run-up to #50, and the return of some characters from earlier in the series. I remember having no idea how long the team would run as a backup, but figured as long as they were continuing, things would be ok. I was NOT all that enthralled with the new villains they were facing. They were very much "typical ’90s villains" and seemed to essentially be caricatures of a sort, playing off the "grim ‘n gritty" wave of characters of the time. 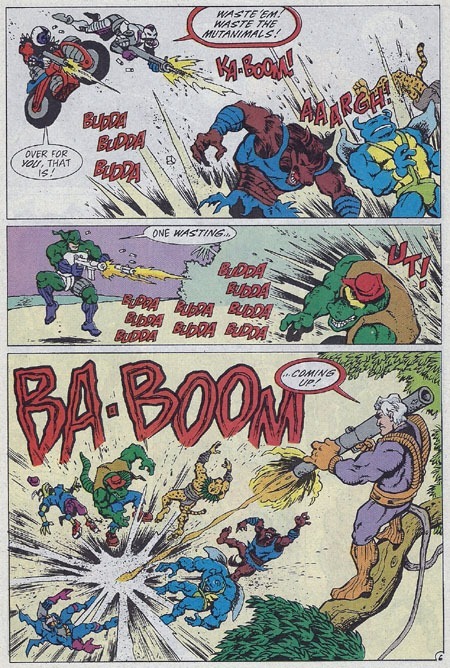 We were introduced to Waster, Fist, Dead-Eye, and Lynch…who were (literally) gunning for the Mutanimals. Over the course of the backup, the Mutanimals finally got a headquarters, aided by the future-versions of Donatello and Raphael (who’d been introduced in the Future Shark Trilogy)…and of course, faced these new villains. Though a challenge, the villains were defeated…but matters became worse with the return of old foes Scul and Bean. 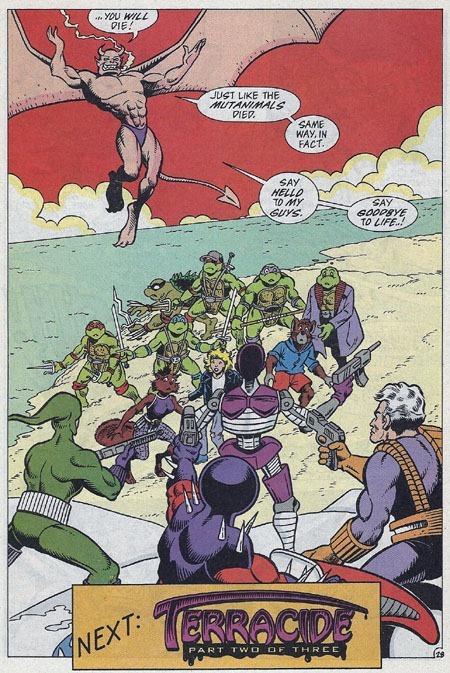 I remember thinking at the time that ok, this sucked, but we’ve got the time-traveling turtles, who seemed to have little trouble coming back in time, so surely they could fix things, despite their surprise at coming back, expecting to find the Mutanimals alive, but instead slaughtered on the beach. Of course, it’d be hard to work their time-travel magic fixy-stuff if they didn’t survive Slash, who had made his way to the site to see what was going on, and on finding the Mutanimals dead, assumed the turtles (standing over the bodies) were the culprits. This ending led stuff back to the main story in TMNT Adventures with the three-part Terracide story. Terracide dealt with the death of the Mutanimals, the turtles (future and present) finding their friends murdered, as well as the revelation and confrontation with the responsible parties! 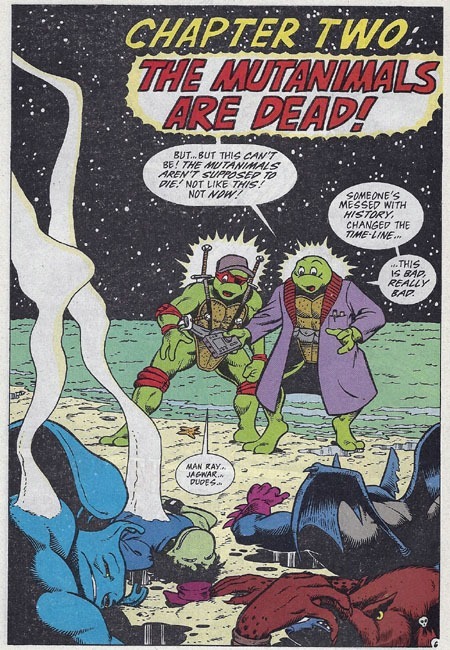 And dark as the Mutanimals’ backup series had been and wound up…it was sort of odd at the time seeing just how dark the main TMNT Adventures got with facing the heavy topic of such death and destruction…particularly of major characters! TMNT Adventures #55 opens with a scene that begins pulling the main TMNT story to the path of the Mutanimals’ story, while Future-Raph and Future-Donnie deal with the immediate situation of the deaths of their friends. 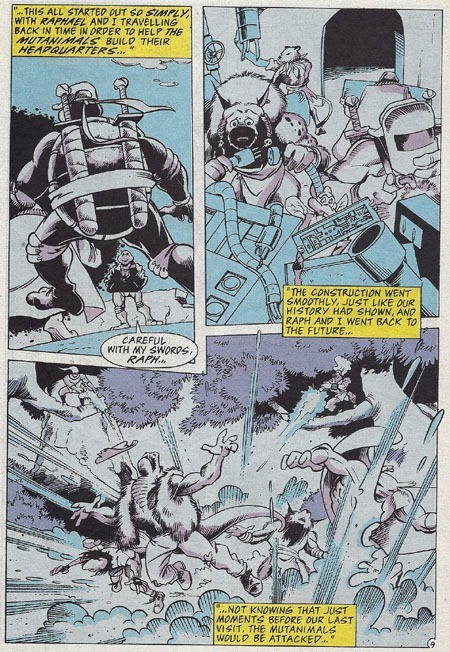 The turtles and Slash are interrupted by the arrival/return of Candy Fine, who witnessed the death of the Mutanimals. They get the story from her (and this basically covers the run of the backup stories). 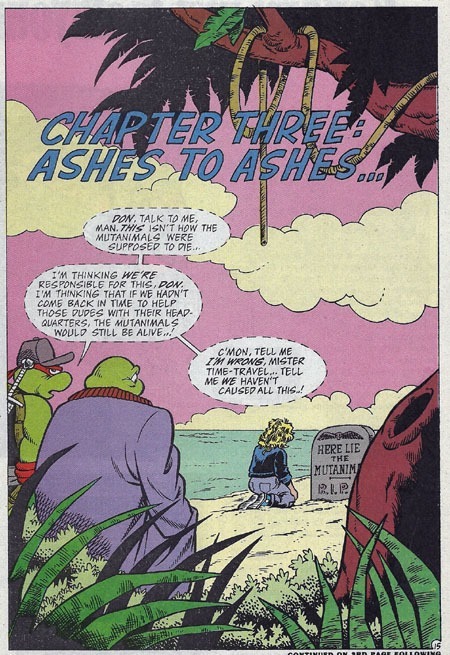 A bit of time passes, as the future-turtles, Slash, and Candy bury their friends’ bodies, and continue to mourn and reel from the shock of this unexpected loss! 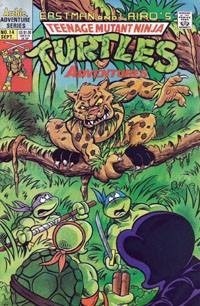 They leave the island, and end up meeting up with the present-day turtles, Splinter, and Ninjara. The entire group runs afoul of the Gang of Four, as well as another old foe, behind the villains and posing quite an epic threat in and of himself: Null! In typical form for comics in an age where collected editions were pretty rare and still a new-ish, unusual-ish format…there was plenty of exposition even within chapters of the same story, in a way that would be pretty unheard of with modern comics. This was the sort of thing that grabbed me, that made the story seem epic and ripe with potential. Yeah, the Mutanimals were killed…but some villain’s messing with the timeline. That means time is being messed with and as such, perhaps could be undone, and at the end of the story, after some hard-fought battle, Time itself would be restored and the Mutanimals would be alive again to carry on. After all…they wouldn’t really be killed off completely and permanently, would they? 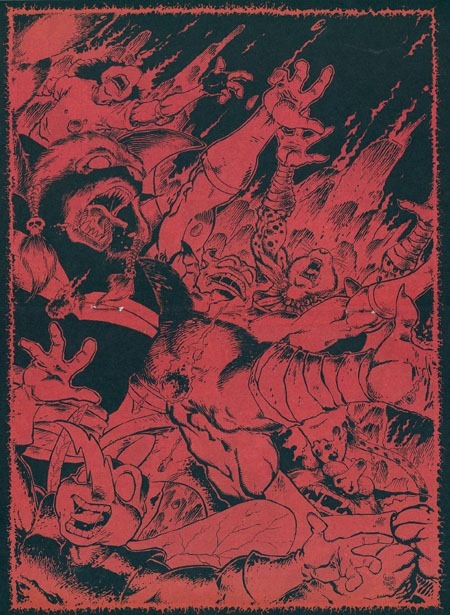 This image was a two-page spread, and quite possibly one of THE most disturbing, disquieting, uncomfortable images of the entire run of TMNT Adventures and The Mighty Mutanimals for me. While Null escapes with Candy, the turtles and Ninjara manage to defeat the Gang of Four in a darkly permanent fashion. Despite having–to a large degree–"won" or achieved vengeance for their murdered friends…Null escaped ,and must still be dealt with. The team splits up–which leads into the following story (this was also a time in which there were subplots and developments that would lead to larger stories, small things and large weaving in and out…but that’s a topic to get into in some other post). In TMNT Adventures #57–Terracide part 3–we find that once more, Null was not working alone. Once more, he has allied with Maligna! And thus, the entire Mutanimals saga basically comes full circle. The characters were brought together, formed a group, became the Mutanimals while stopping Maligna’s initial invasion attempt of Earth. Now the alien insect queen is back, and it is ultimately she who arranged for the Mutanimals’ deaths! Pretty dark, a villain(ness) winning on such a grand scale. But perhaps also effective in raising the stakes, showing just how dangerous she truly is (if not how flat-out lucky the Mutanimals were the first time dealing with her), and story-wise, allowing that much more a sense of stuff in the need to defeat her. The turtles and their allies fight valiantly, but in the battle, Maligna’s ship is stalled, and headed right for the sun…they’re not even sure if they’ll escape. But Slash refuses to join them. After seeing his own world destroyed, after all he’s been through, and his rather recent "redemption" and allying with the Mutanimals only to see these new friends unceremoniously killed, he stays behind to buy the time the turtles and friends need to be capable of escape. Slash is killed ensuring Maligna and her allies cannot escape. Though the Mutanimals are gone…the orchestrators of their deaths are also taken off the board. Some measure of justice or revenge or what-have-you. On the subject of death in comics, there’s plenty out there on a number of topics. Add to that that I wanted to pick a topic that I hadn’t really seen specifically covered anywhere, for my participating this first time in the Super Blog Team Up. 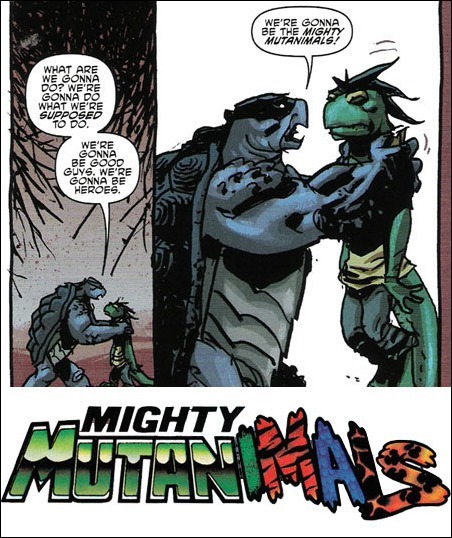 I realized that offhand, I’d virtually never seen/heard reference to the Mighty Mutanimals by anyone else in general/casual comics discussion, and "the concept" of the Mutanimals has been somewhat redone in recent years. Actually, their being redone has unfolded twice–once in the soon-to-end TMNT animated series from Nickleodeon, and the current ongoing comics from IDW. And a recent arc in the main TMNT book that involved the new iteration of the Mutanimals actually (for a moment as I read) gave me a slight "flashback" to the ’90s iterations’ deaths as I wondered if they were basically killing the group off in the current continuity. (Spoiler-ish: they didn’t, at least in that one). So with that stuff on my mind, I chose my topic, and here we are. But what does/did it all MEAN? Well, offhand, my initial response would be that their deaths didn’t really seem to mean much of anything, back in the ’90s…Not in the grand scheme of things, not outside of anyone reading Archie‘s TMNT Adventures, anyway. 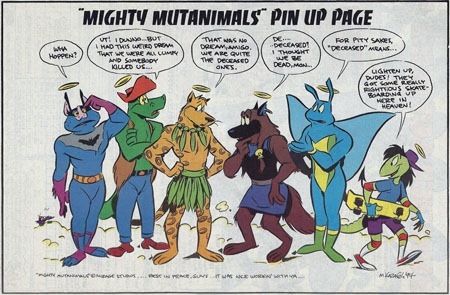 I don’t think I’ve ever seen reference to the Mutanimals’ deaths in any "death list" from the ’90s…I’m pretty sure I’ve never seen any mention of them in regards to the "effect of the ’90s" on comics…heck, outside of TMNT-specific sites and message forums, I don’t know that I’ve ever seen them mentioned, or any of their comics covered, etc. The death of the Mutanimals certainly never overtly–that I am aware of–particularly inspired anything or caused any great ripples or garnered any specific attention or referencing. So now, a quarter-century later…I am doing it. I am referencing them, and this, and devoting one of (if not THE) largest blog post I’ve ever written to the topic. 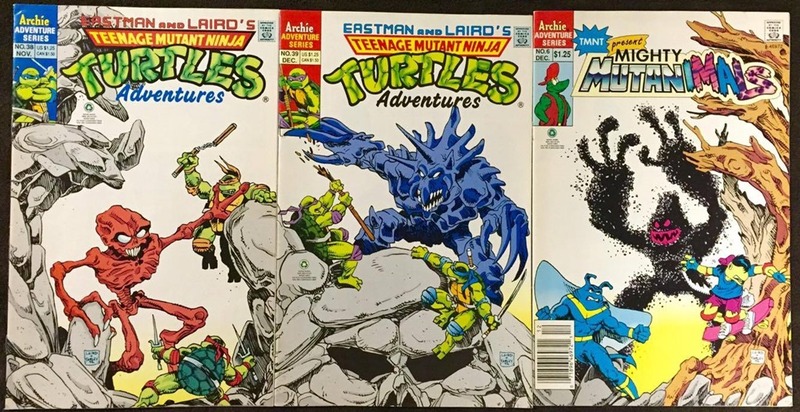 I was introduced to the Teenage Mutant Ninja Turtles in the fall of 1988…around the same time that I was introduced to comics (but that’s another story for another time). I resisted at first, but eventually "gave in," and then EMBRACED the concept…from the cartoon, to the toys, to books, comics, cereal, the movies, everything. I have some somewhat conflicting memories–of a lot of little elements in a relatively short time span remembered after over 25 years and 3/4 of a lifetime. But this isn’t where I talk about my history with the turtles. This is my history with the Mutanimals. I had a birthday party at a local skating rink, and I think that might be where I was given Ray Fillet, one of the more "random" characters that I didn’t actually know anything about at the time other than what was printed on the card of the figure. 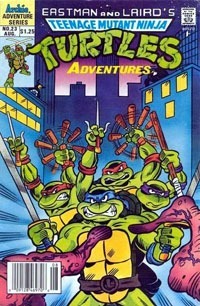 I also remember several "storybooks" of the TMNT, including one called A Fishy Adventure. This one was a story about the origin of Ray Fillet, mutated from marine biologist Jack Finney, and his first encounter with the turtles. 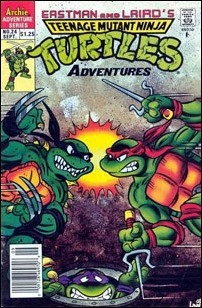 I would later learn that it had the same story as one of the comics–an issue of TMNT Adventures. Nicely enough, said issue was the start of that series’ diverting from merely adapting episodes of the cartoon into a continuity all its own. I also got an issue of this color TMNT comic series at a flea market called The Red Barn that my aunt had worked at. I lacked plenty of context of the series–it was #17, and I don’t think I had (yet) read any other issues, except maybe #8 and possibly #11 that a friend had had. But this issue had the turtles, as well as April and a character that looked like Ray Fillet, but in the comic was called Man Ray. I distinctly remember arguing with a friend over the pronunciation of Mondo Gecko’s name. "Mondo Geh-koh" vs. "Mondo Geek-oh." I was adamant it was "Mondo Geh-koh," largely due to one of my earliest memories in life involving toddling out to the kitchen for a drink of water and being startled by a gecko running across the front of the fridge. I don’t know if I had the figure yet and the argument arose from the pronunciation then and there, in which case I’ve crossed memories with Ray Fillet; or from talking about the character because it appeared on the back of the card for Ray Fillet. But I was interested in and wound up with/had Mondo Gecko. 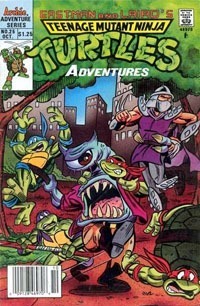 I vaguely remember the character appearing in an episode of the cartoon, but moreso I remember the issue he first appeared in in the TMNT Adventures series–#18–being one of my earliest "priced" back issues, bought for around $5 at Capp’s Comics (4+ times cover price) at a time when most new comics topped out at $1.50. I’m pretty sure my earliest memory of Leatherhead is his appearance on the cartoon, bullying the "Punk Frogs," and sporting an awful cajun-ish accent that makes Gambit sound like Frank Sinatra…and a quasi-catch-phrase of "I guarantee!" I also remember the character’s figure being rather awkward and crouched over and far less "upright" the way most other characters’ figures were. 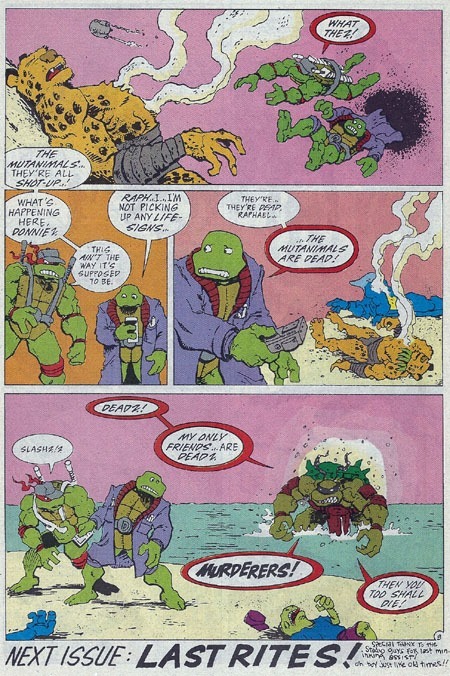 There was another "storybook," I believe TMNT: The Fight for the Turnstone, that had a completely different version of Leatherhead in it…one in which the character was an ALLY of the turtles rather than a villain, and had apparently started out as a human and was magically changed into a gator-man, rather than an alligator mutated to humanoid form. 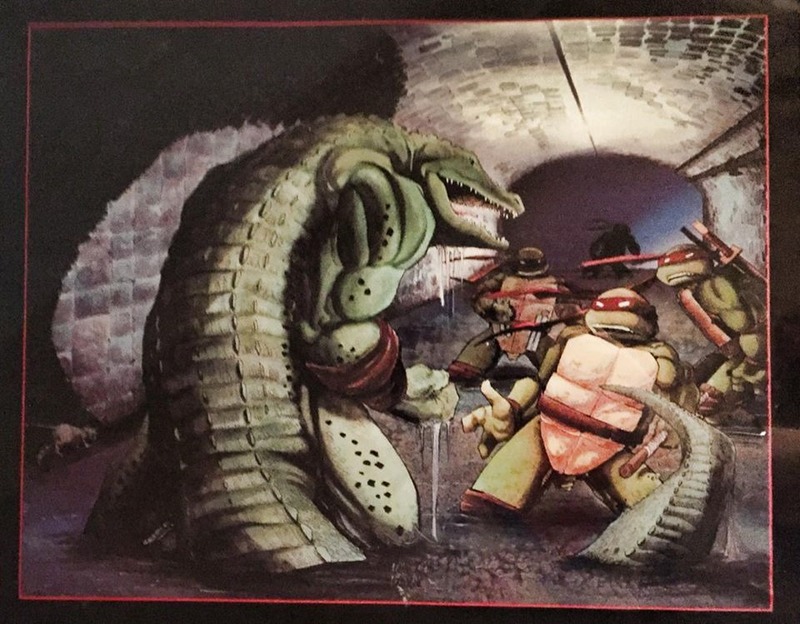 I also remember an image of the turtles fighting a giant alligator creature from a calendar my aunt got me (for the art, I think it was from the year before…I still have several of the pages, now framed and hanging as wall-art). I learned that this other version of the character (from the Mirage/original comics) was quite different from either version I’d encountered. I got TMNT Adventures #6–that version of Leatherhead’s first appearance–from a bargain rack at Comics & Collectibles, another of my earliest "specific back-issue purchases/finds" in my earlier days of being "into" comics. It may well be deja vu of some sort, but I do consciously (now) know that Wingnut and Screwloose were in The Fight for the Turnstone along with Leatherhead and various other characters. 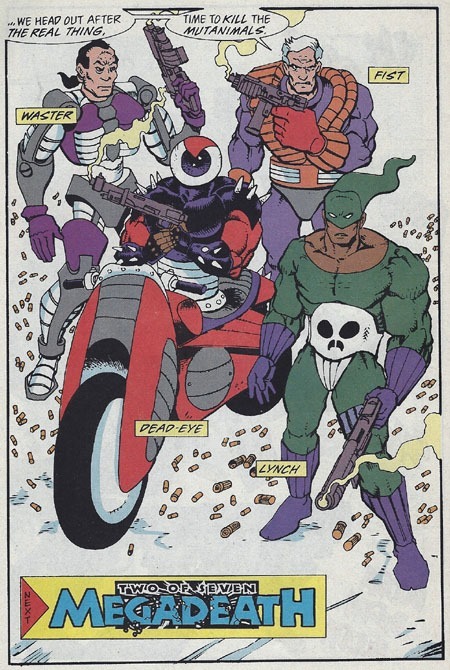 Thinking back to as early as I can remember, I’m pretty sure that I first encountered these characters in TMNT Adventures #8 that a friend had, where I read their origin. I also remember another friend (that I’d argued with over Mondo Gecko) having the Wingnut action figure that came with a miniature Screwloose, much as Muckman had come with Joe Eyeball, or several other characters came with "sidekick" like characters…except that "Wingnut and Screwloose" were more "named" and went together in a way that a lot of others (outside of Muckman and Joe Eyeball) did not. The comics version was not much like the action figure in appearance–they were recognizably the same, on the surface, but not having the figure myself, I saw the comic version as quite different. And much like with Leatherhead, I remember their being part of the Turnstone story in that storybook, which I later learned was based on an issue or two of the TMNT Adventures comic series. 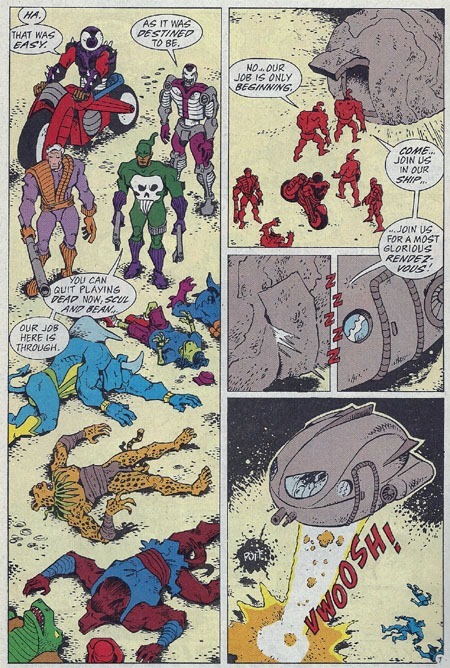 Jagwar and Dreadmon were slightly later introductions for me, I believe I "met" them in the TMNT Adventures 1991 Winter Special, which reprinted the Mighty Mutanimals mini-series in a single issue. I later learned of their "origin issues" and got those for about $5 each, much like with Mondo Gecko’s appearance, from the "priced" back issues bins. I don’t remember their playing MUCH of a recurring role in TMNT Adventures the way Leatherhead or Man Ray did…I mostly recall them AS Mutanimals characters. Slash is one of the earliest villain characters I remember getting from the toy line, after Rocksteady, Bebop, and the turtles themselves with Shredder, Casey Jones, and April. 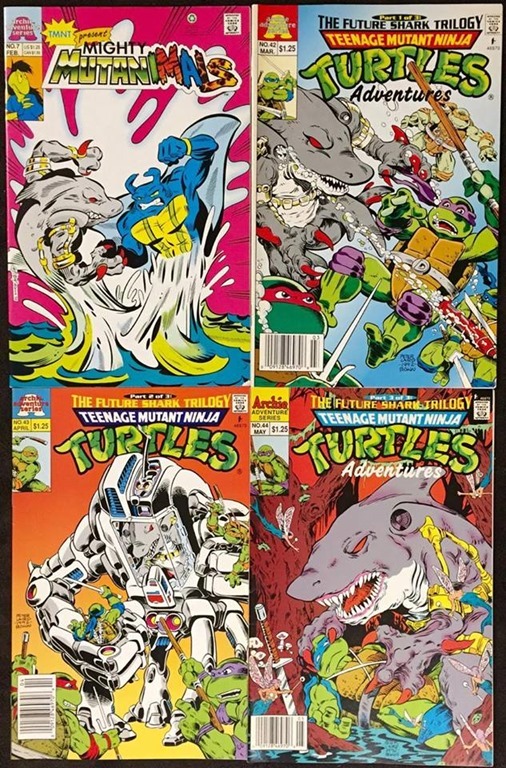 At the same time, remembering getting into the toys right at the height of their major popularity, it’s possible that I actually had Slash BEFORE the four turtles themselves! I distinctly remember rummaging through pegs and pegs of figures with Dad at the local Toys R Us (which is still there, as of this posting) and him wondering if the character might be popular for also being a turtle. I then recall the character in TMNT Adventures, from my first "off the spinner rack" issue of the title, #25; and sometime after "backtracking" to his encountering the turtles in #24, before eventually getting back to #23 at whatever point I got that issue. I believe I saw the character also on the cartoon, though right now I don’t remember if that would’ve been before or after the comics. 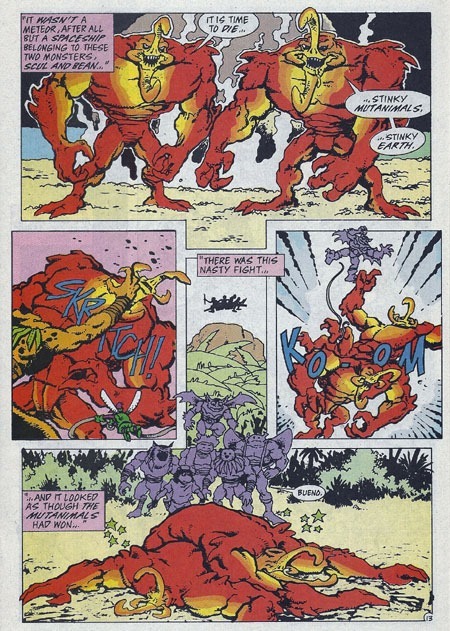 I do remember Mutanimals #9 with Slash’s return, and then the character’s involvement in Terracide, as well. 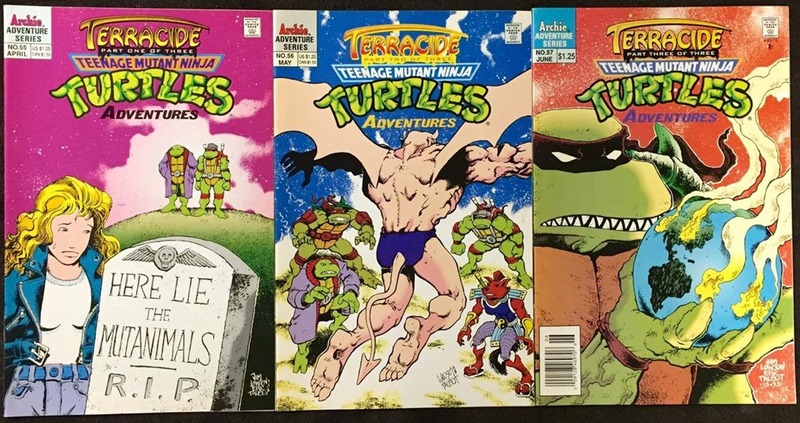 Several months after getting TMNT Adventures #25, I found a thick TMNT comic on the spinner rack at Waldenbooks, along with what turned out to be the final chapter of a multi-issue story in TMNT Adventures #30. 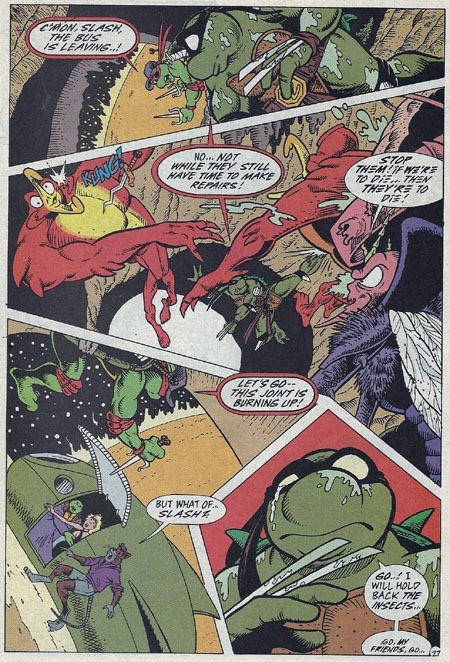 The Winter Special starred The Mighty Mutanimals, and was an EPIC story of Raph and Mondo Gecko stowing away in villainous aliens’ ship and facing Maligna in her hiveworld, while Man Ray, Jagwar, Dreadmon, Leatherhead, and Wingnut and Screwloose dealt with Malignoid insect creatures eating the rain forest and such. I remember reading this thick issue and seeing pretty clearly the issue breaks, and "sensing" that these were like three issues (despite being one big issue). 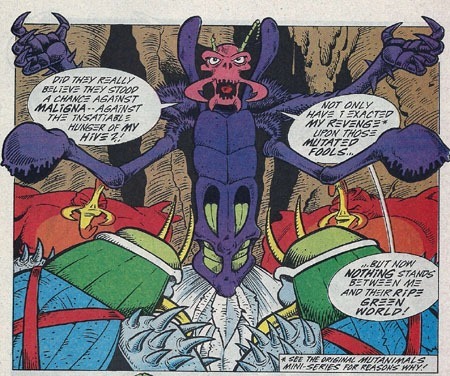 Of course, I later learned I was correct, when I discovered the three-issue Mighty Mutanimals mini-series. I also got the first issue of the ongoing series when that came out–it was RELATED TO the TMNT, and was a #1, so…yeah! 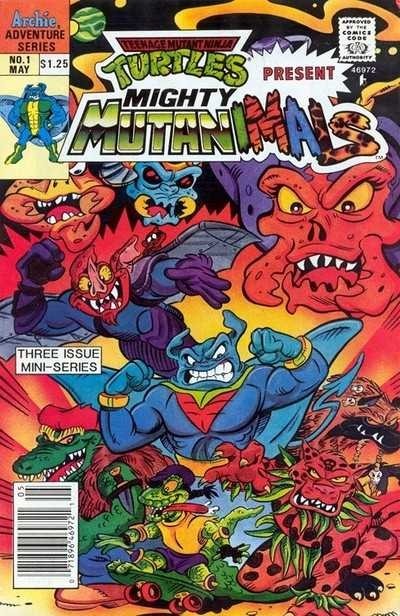 Unlike the monthly TMNT Adventures, the Mutanimals title was a somewhat bimonthly book, not actually having a new issue every month. It eventually had a crossover issue with two TMNT Adventures issues in the 1992 story United We Stand (mentioned earlier). 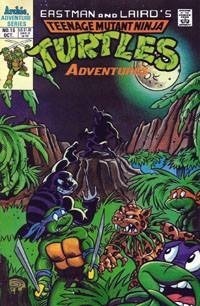 I have a memory of a family vacation to Niagra Falls, and finding TMNT Adventures #36 and Mighty Mutanimals #4, and making the conscious decision at that point that I’d have to "give up" collecting the turtle figures to keep up with the comics, and WANTING to keep up with the comics more, enjoying their stories and such. 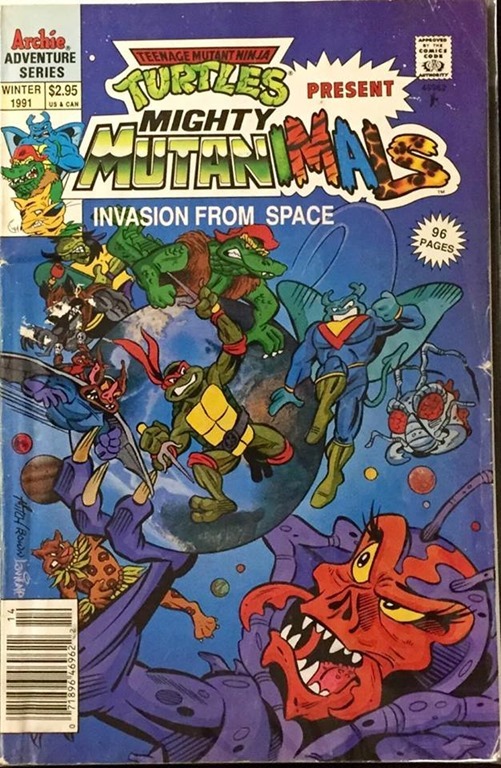 I remember reading in the letters pages about the possibility of a Mutanimals cartoon and being excited at that prospect…and the disappointment when not only did that not come to pass, but that the Mutanimals series was ending at #9, perhaps to return if anything would ever come of a cartoon, but that was that. 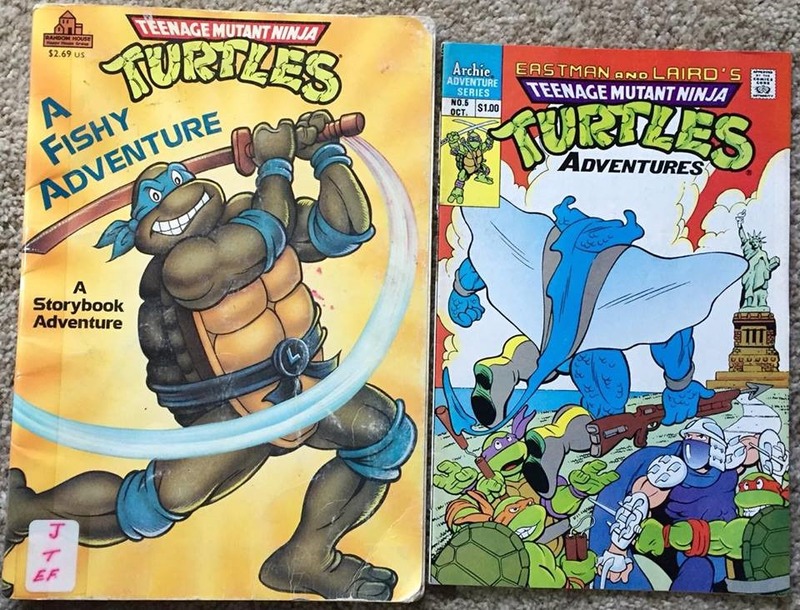 I somewhat recall being disappointed when the then-new backup feature started in TMNT Adventures, at how few pages they got, and that it wasn’t even a full "short" story, but just a few pages of some longer story. I enjoyed that we had some new villain characters for them, and that the "future turtles" Don and Raph were involved, and the Mutanimals were getting an HQ…it seemed ripe for a long-lasting "backup" that could lead to a new series and all that. I was completely shocked when the end of the latest chapter of the backup in TMNT Adventures #54 saw the characters shot and blown up–killed–in what would be the final "backup" feature (though that story was shifted to the primary for the three-issue Terracide arc). Given the presence of the time-traveling Raph and Don, though…I know I’d THOUGHT they’d pull something outta all the time-travel stuff and wind up saving the Mutanimals…but they didn’t. 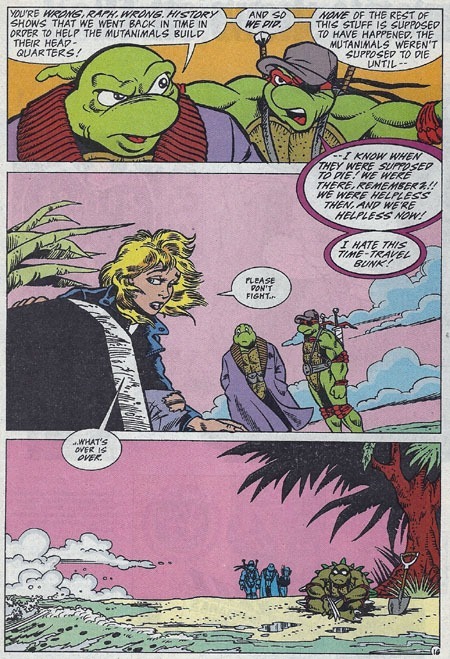 We learned of Null and Maligna’s return and through the time-travel turtles that the Mutanimals were "fated" to die and such, and that they couldn’t be saved. I was horrified at these deaths. These characters that I’d come to know in a way, that I’d gotten to read their debut "new" and follow their ongoing series from #1 (back then, a new #1 was actually a special thing!) were a pretty big deal to me. 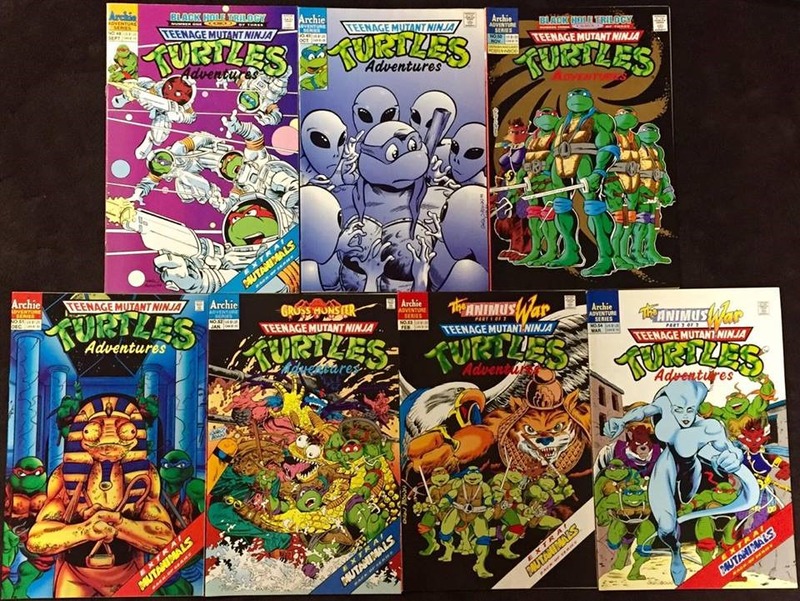 Sure, they weren’t the turtles themselves…but they’d all premiered in the pages of the TMNT Adventures title, and had been spun off into their own title, and even back then I had fond memories of the characters. It always stuck with me, the Mutanimals having been suddenly and without much warning machine-gunned down, then blown away with a bazooka. No fancy last words, no long-winded death scene, no real goodbyes, no cover proclamation that In This Issue: Everybody Dies!…just suddenly the characters were actually shot ‘n killed, and that was that. 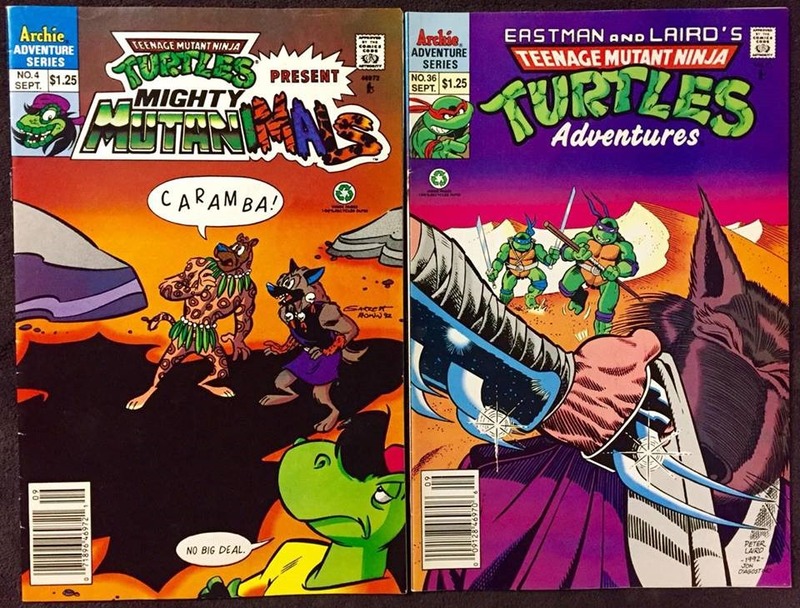 While I followed the TMNT Adventures for a few more issues…I actually missed an entire 4-issue arc, and there were only 15 issues of the title at all after Terracide, so this was sorta the "last, big event" of that title. With the Mutanimals gone, it was like the "heart" of the universe went with them. In my searching, I did stumble across a blog from Steve Lavigne and Ryan Brown with a wealth of cool Mutanimals stuff, as well as another blog that seemed to be from Ryan Brown on the Mutanimals. And there was a great TMNT Entity post about the cartoon that almost was. 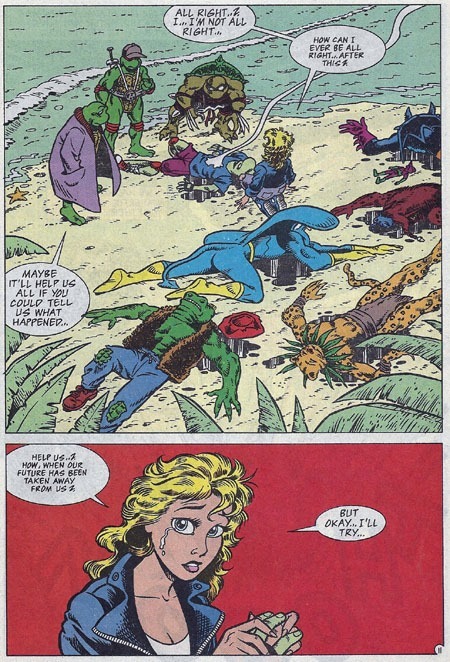 At the time, I lumped the death of the Mutanimals in with the rest of the ’90s and such, as it came about when it seemed like killing off major characters was the "in thing" TO be doing in comics. 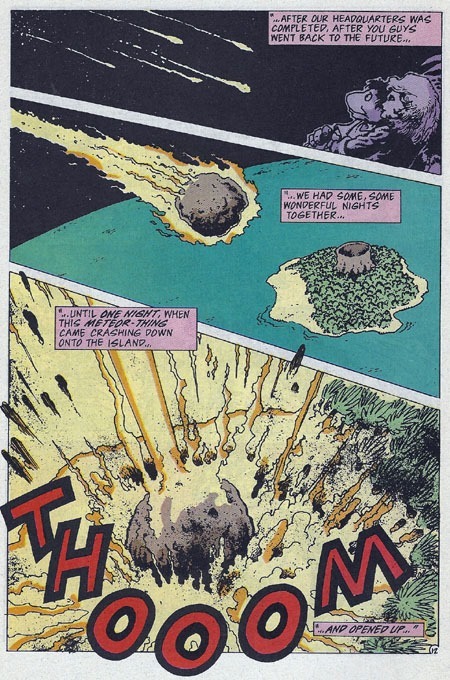 Important as the Death of Superman and Batman: Knightfall were to me as a kid, I think the Mutanimals’ death was the most shocking. I don’t recall it being at all advertised ahead of time–it just happened. Then Terracide was another dark story, and not what I "expected" of the series. I also have to wonder, in retrospect, at the impact on me with the TMNTA series itself…I got Terracide, and the 2-part story of them rescuing Michelangeo, and the Cyber-Samurai Mutant Ninja Turtles 5-parter. But I completely missed a 4-part story involving Ninjara, and don’t remember if it was when I got that story that I also got the final couple issues of the series, or if I had gotten the final couple issues when they first came out, just having missed/skipped the previous four issues. But in a lotta ways, the Mutanimals were largely the "heart" of the TMNTA universe beyond the core turtles. They started out as "mutants of the month," new characters created/introduced to give some "story" to action figures concepts (or so it may have seemed at the time); but they also fleshed out and populated a wider TMNT Universe and ongoing saga that was rather definitive for me as a kid…and TMNT Adventures lasted more issues than ANY other TMNT series to date, though IDW‘s run is going to surpass it next month. In the last couple years, it’s been "interesting" seeing some of–or some form of–the characters brought back in IDW‘s main TMNT title. It was also interesting seeing the concept incorporated into the 2012 Nickelodeon TMNT series as well. 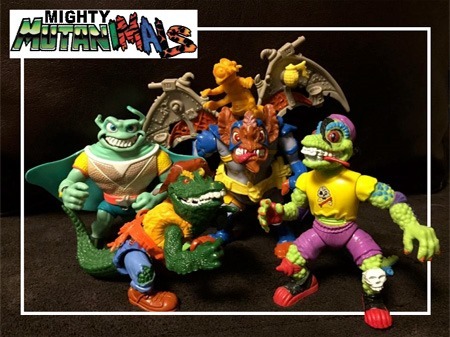 I even just earlier this year acquired Leatherhead and Wingnut & Screwloose for the first time ever, "completing" my set of the classic action figures versions of the Mutanimals. But while I’m enjoying seeing the new iterations of the various characters, there’s a part of me that doesn’t exactly want to "accept" them. After all, they’re NOT "my" Mutanimals. 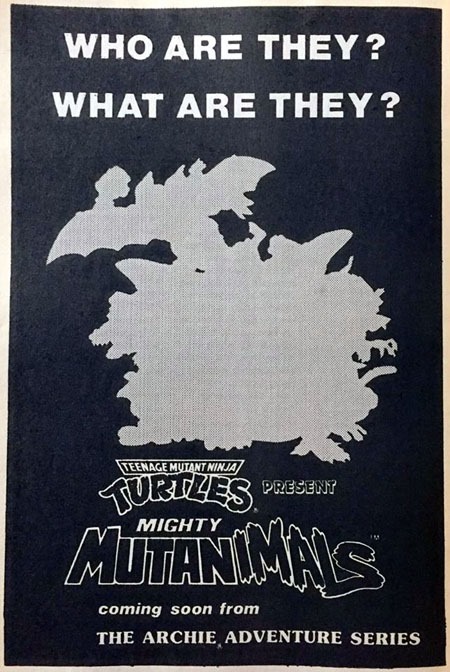 "My" Mutanimals died in 1993, some 24 years ago. Though I think the IDW iteration of the Mutanimals is already rivaling (if not surpassing) the longevity of the originals, it’s still a different concept to me. That said…there’s such a history to the Mutanimals as a group and individual characters that I catch myself mentally shifting some of that to the new versions of the characters. And then over the course of the time I spent thinking about this topic, re-reading stuff, researching, and generally planning and procrastinating the actual writing of this post…two more TMNT issues came out, and each re-introduced an old, familiar character in a new way! The main TMNT title introduced the IDW iteration of Jagwar in #71…while TMNT Universe #11 introduced the IDW iteration of Dreadmon! So while I have mixed feelings even there…it was a joyful evening to read those issues, and cool timing with me working on stuff for this post, and even manages to make me feel a bit "old" realizing how long it’s been and simply that I’ve been around long enough to see this come to pass. But despite the ’90s, despite their deaths, despite it not seeming to impact much outside the TMNT sphere of direct influence…it’s apparent that the characters work, that they’re remembered, that they’re worth bringing into the contemporary TMNT universe/continuity…and that they matter. I could keep going on and on…but I need to end this post somewhere. I’ll certainly be revisiting much of this in the future, once I get back to my TMNT Revisited project/posts, covering the Archie TMNT Adventures issue-by-issue…including the Mighty Mutanimals issues. While a lot of books and such that I get are relatively spur-of-the-moment, there are certain volumes that I’ll know exist(ed) or learn will be coming out sometime in the future that I’ll particularly look forward to. Several of these converged into just a couple days last week, though several more days were involved in terms of spacing of orders placed. Awhile back, Bleeding Cool and their “glitch watch” had a piece up about a number of volumes heavily discounted on Amazon, including 50% off the then-upcoming Batman: Knightfall Omnibus vol. 1. With their “pre-order price guarantee,” I figured I’d jump on it for this one, as the price (for me) then had nowhere to go but down, and at a starting point of 50% off, anything else would be icing on the cake. Of course, I seemed to have gotten in at the lowest price, and though a week after comic shops, my card was charged and the book came, so it’s now a part of my collection. Though it’s got some slight dings/dents…with stuff going on in “real life” right now, I do NOT have the “heart” to fight Amazon over the condition of the thing! Especially as it’s the sort of stuff that I’d honestly “expect” or “accept” buying such a volume in a comic shop or certainly at a used-books shop. Plus, I’m hoping that this will truly be a definitive edition, and sturdier than the thick paperbacks I’ve been afraid to use for re-reading for fear of killing the spines. Then, in the Aliens side of things, I hadn’t expected either of these volumes out until the 26th of April–“Aliens Day,” (LV-426). 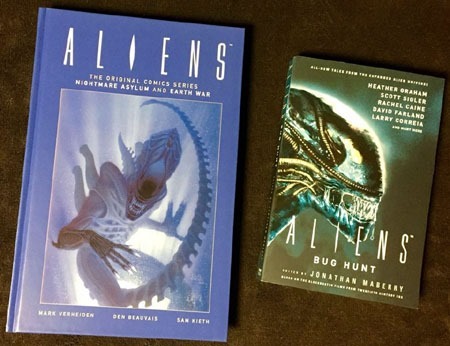 However, I realized that the hardcover of Aliens: The Original Comics Series Nightmare Asylum and Earth War was already out/available; so I ordered that through InStockTrades. A few days later, checking up on the exact release date and price for the anthology volum Aliens: Bug Hunt, I learned that it, too, was already available on Amazon. 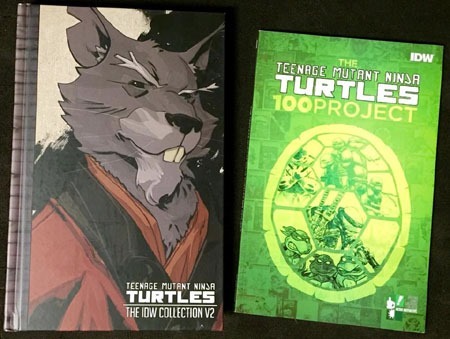 Along with the Aliens original series, I also ordered The TMNT 100 Project. At the same time that I was checking on the Bug Hunt volume, I saw that Amazon had TMNT: The IDW Collection V2 back in stock and for as steep a discount as I could expect from InStockTrades…though the latter did NOT have it in stock, so I placed the order through Amazon. Despite some 5 days’ difference in placing these two orders, all four volumes arrived on Friday. 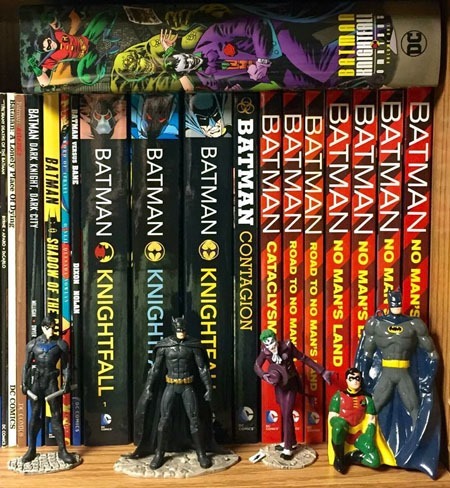 The Knightfall volume doesn’t actually have room on the shelf at the immediate moment. I’m hesitant to ditch the paperbacks entirely until the 2nd Omnibus is out this summer…and my entire collection has grown enough in areas over the past year-plus that I need to do a mix of weeding and adding a couple additional bookcases to hold stuff and spread things out so it’s not all crammed together. 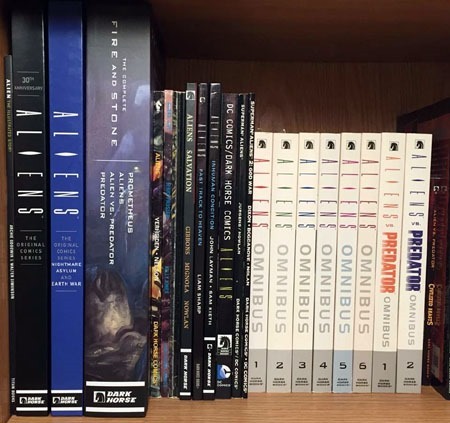 It’s sort of amazing to think that the two “Original Comics” Aliens hardcovers’ content is crammed into the Aliens Omnibus vol. 1…but the size difference is also amazing, and far preferable in the larger format. That said, until or unless all the other stuff would get reprinted in this format, I’ll settle for the larger “library” with some doubling-up of actual content with the different editions. I’m also looking forward to/hoping for another volume like The Complete Fire and Stone volume for the concludes-this-week Life and Death mega-arc from the past year or so. I believe that, at last, I’m actually up-to-date/current with IDW‘s releases on the TMNT Adventures volumes as well as the TMNT: The IDW Collection volumes. 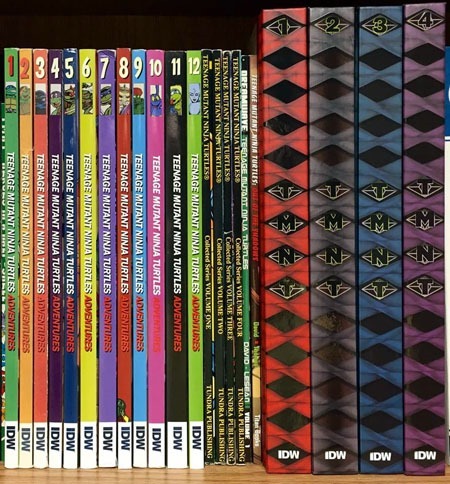 The IDW Collection volumes–as only 4 volumes–surpass where I’d left off with getting the paperbacks of the ongoing series, the Micro-Series, and the various other mini-series they’d done. And these hardcovers are far superior as they reprint stuff in more of a story-order, where one does NOT have to switch back and forth between multiple volumes to get the proper experience of developments in continuity. This is the point I’d looked forward to getting to a year and a half or two years ago or whenever it was they started these editions–stopping me in my tracks on the paperbacks. I suppose I’d also like to note that apparently the TMNT: The IDW Collection V2 had managed to either go outright out of PRINT or at least out of stock… whatever the case, it was enough for third-party Amazon sellers to jack the pricing up to ridiculously astronomical prices. Several weeks ago, I saw something from Diamond with the volume on a list of “Back in Print” stuff, so simply waited for it to show up at a reasonable price again. 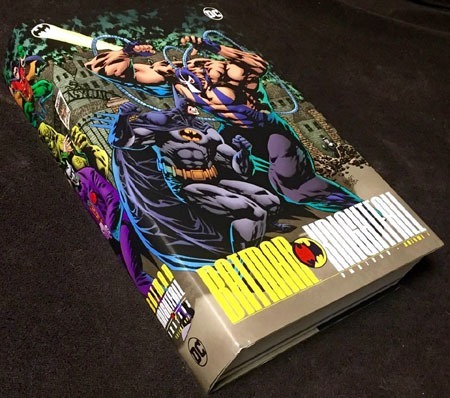 This reprinting/re-availability of a “middle volume” is something that it seems like Marvel in particular does NOT do: if something from them goes out of print, it STAYS out of print, at least until they do a whole new trade dress/presentation of something…which then means that even if the story is available again, the volume no longer “fits” into a series on a shelf. This is one of the primary reasons I’ve NOT continued with the Cable & Deadpool paperbacks, nor gotten into the Deadpool Classic books: I’d love to get them, but I simply DO NOT TRUST Marvel to keep/have them in print long enough for me to actually get the entire series…and I absolutely do not want to get 6 or 7 or even 9 or 11 volumes in, just to suddenly have the final few only available to me for quadruple-or-more the cover price (when cover price itself is far more expensive than I’ve any interest in for the books)…or worse, have a random volume here and there out of print where I can’t even GET more than 3-4 volumes in a “run”. But I suppose that gets into stuff for another post sometime. Well, I think it’s official: my new "thing" right now seems to be classic/vintage TMNT figures…given the below, the ones I bought a couple weeks ago, and the ones that arrived just last week. End of last week, since it was relatively "on the way home" from work, I stopped in at Big Fun (vintage toys store) and snagged three figures from "the case" (and got a surprise discount for buying multiples!) and one from a bargain bin. Finally, the Triceraton is missing its tail…but I already knew I could order a replacement tail online such that this one as-is and the tail combined will work out much cheaper than finding a "whole" figure. While I’m sure I’ll add other figures as I see them, learn of them, or re-realize their coolness and such, my current "want list" is as follows, for replacing figures that I’d had and need/want to "restore" my original collection as well as adding characters I never did get as a kid. 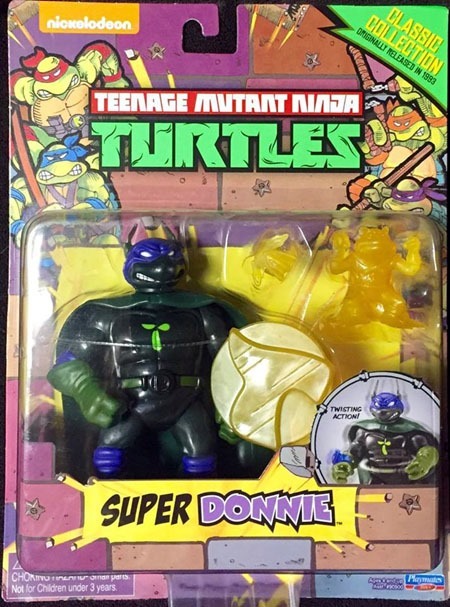 I don’t remember Super Donnie in stores in 1993…and I think by 1993 I was or had already shifted away from collecting the figures, in favor of comic books. 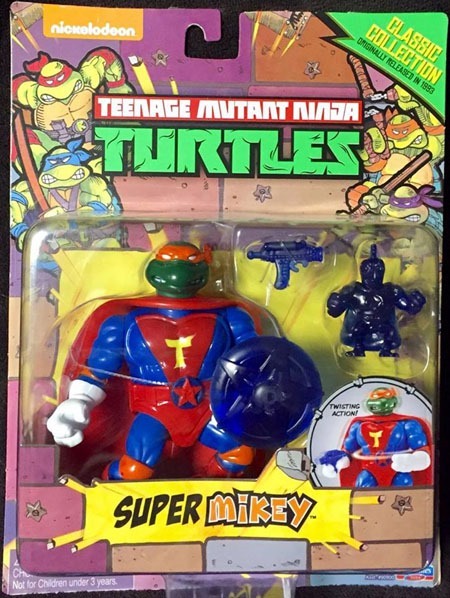 And not much sense getting Super Donnie without also tracking down Super Mikey! I also believe I’m–at long last, this half-decade or so later–completely "caught up" on the Teenage Mutant Ninja Turtles Adventures volumes from IDW. I’ve been frustrated for weeks at the insane prices for vol. 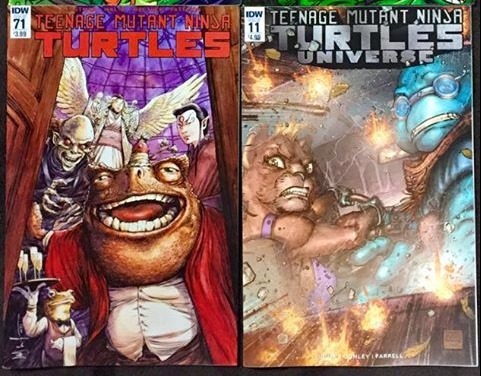 2 of the TMNT by IDW series…why a "middle volume" (especially so early in the run!) would be out of print has been BEYOND me. Thankfully, the other day, I saw a list put out by Diamond listing new reprints of previously-out-of-print volumes, and spotted it on there…so I should be able to be caught up by the time the fifth volume comes out, whenever that is, in the next couple months. 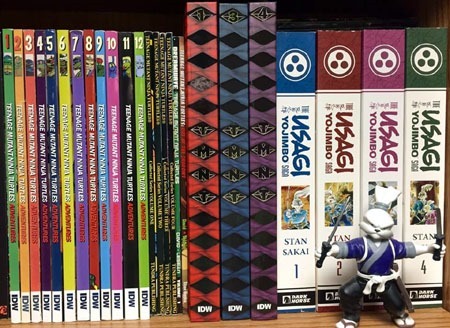 I also want to get the rest of the Usagi Yojimbo Saga volumes before any of 5-7 go out of print. I have yet to actually read any of these (unfortunately!) but I’ve been "holding out" to also hopefully come across good pricing on the pre–Dark Horse stuff, and read the entirety of the character’s saga. I guess we’ll see what the next few weeks hold for TMNT stuff in general!